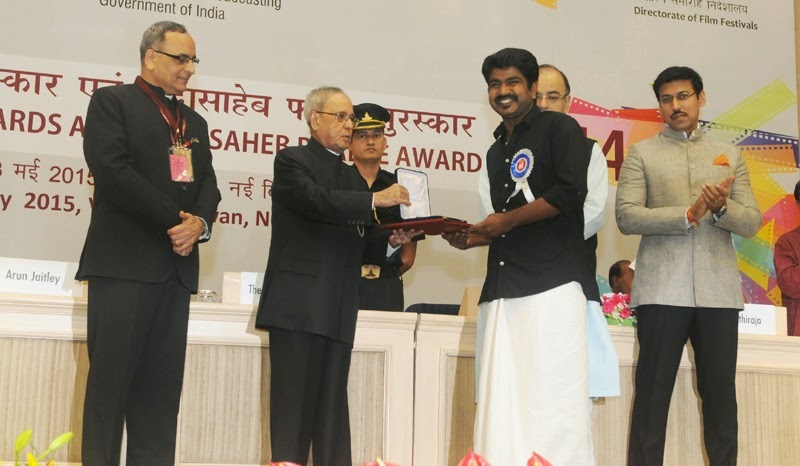 It gives me great pleasure to join you on the occasion of the 62nd National Film Awards function. 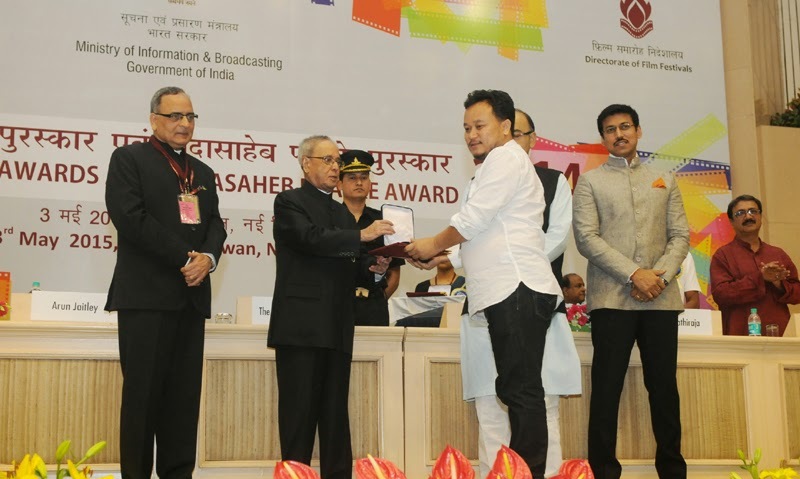 The National Film Awards stands for immense honour befitting the highest governmental recognition in the field of cinema. 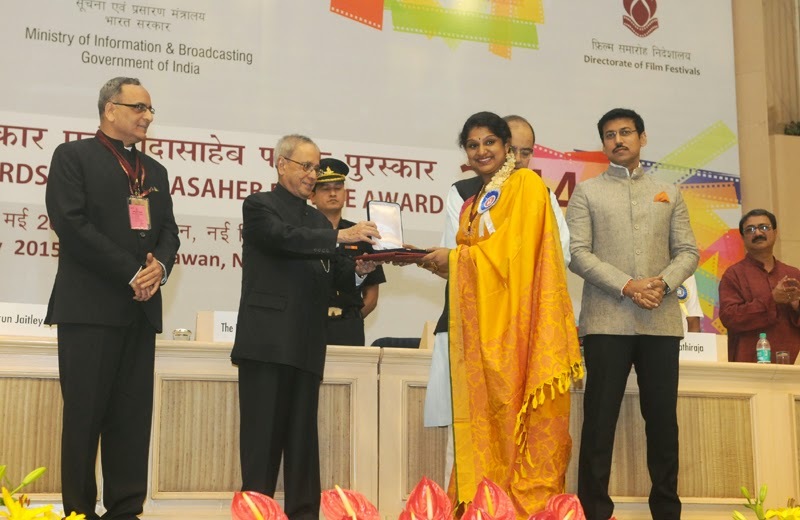 I welcome and congratulate all the recipients of the 62nd National Awards. You have done India proud and placed our cinema yet again on the global radar. I also compliment the Chairpersons and Members of the Jury for a job well done. 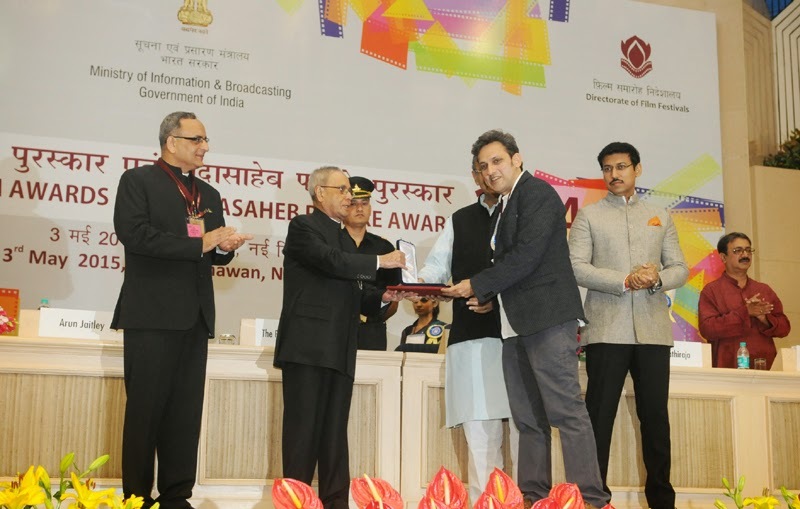 The President, Shri Pranab Mukherjee presenting the Rajat Kamal Award for Best Anthropological/Ethnographic Film “Qissa – e – Parsi : The Parsi Story” in Non Feature Films Section to the Director, Ms. Divya Cowasji, at the 62nd National Film Awards Function, in New Delhi on May 03, 2015. The Union Minister for Finance, Corporate Affairs and Information & Broadcasting, Shri Arun Jaitley, the Minister of State for Information & Broadcasting, Col. Rajyavardhan Singh Rathore and the Secretary, Ministry of Information & Broadcasting, Shri Bimal Julka are also seen. My special congratulations to Shri Shashi Kapoor who has been honoured with the Dadasaheb Phalke Award this year. His contribution to cinema has been manifold and tremendous. He is a true living legend. Shri Kapoor began his career as a child artist in the films Aag and Awara, and then we saw him as a flamboyant hero in many blockbuster films. He made his mark not only as an actor but also as a producer with remarkable contributions to Indian Cinema even while he expertly balanced two lives in theatre and cinema. 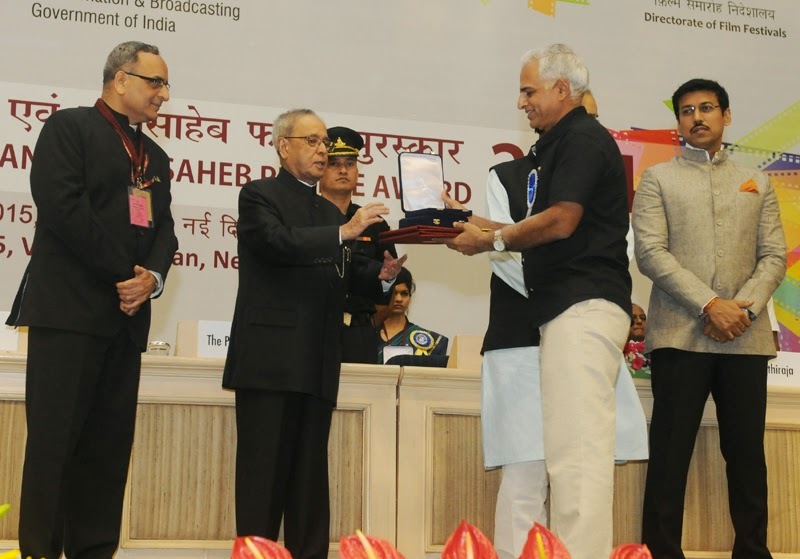 The President, Shri Pranab Mukherjee presenting the Rajat Kamal Award for Best Biographical Film: “Aamaar Katha: Story of Binodini” in Non Feature Films Section to the Director, Shri Tuhinabha Majumdar, at the 62nd National Film Awards Function, in New Delhi on May 03, 2015. The Minister of State for Information & Broadcasting, Col. Rajyavardhan Singh Rathore and the Secretary, Ministry of Information & Broadcasting, Shri Bimal Julka are also seen. Shri Shashi Kapoor is the third person to win the Dadasaheb Phalke Award from his illustrious family, the others being – Shri Prithviraj Kapoor and Shri Raj Kapoor. My compliments to the entire family which has given so much to Indian cinema. I wish Shri Shashi Kapoor a long and healthy life. Cinema has been an integral part of Indian culture and entertainment from the days of Dadasaheb Phalke’s Raja Harish Chandra of 1913, the first film made in India. Indian cinema transcends national boundaries and is a powerful purveyor of ideas and values that impact the consciousness of millions of people. Our movies not only showcase the multicultural diversity of our country but is also a tribute to our linguistic richness. They are a national treasure and our country’s “soft power” in the true sense of the term, forging international ties and navigating global horizons with ease. 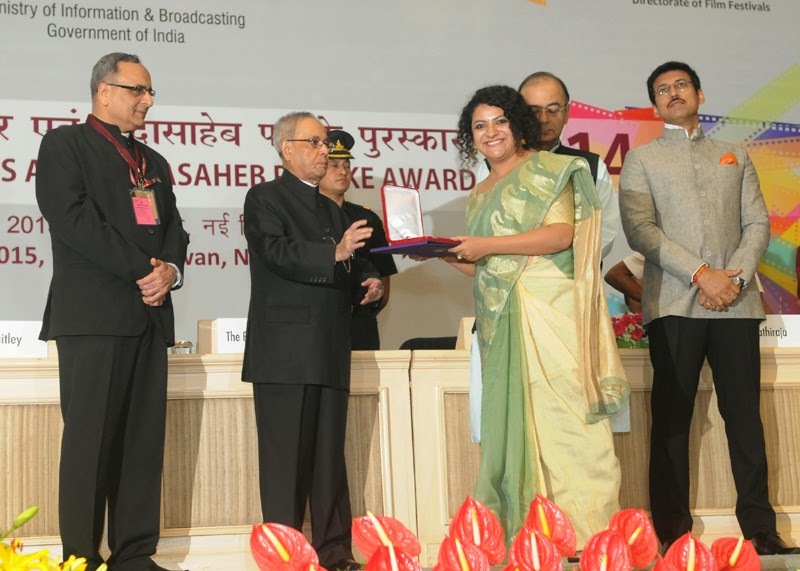 The President, Shri Pranab Mukherjee presenting the Swarna Kamal Award for Best Direction “Aaranyak: in Non Feature Films Section to the Director, Ms. Renu Savant, at the 62nd National Film Awards Function, in New Delhi on May 03, 2015. The Union Minister for Finance, Corporate Affairs and Information & Broadcasting, Shri Arun Jaitley, the Minister of State for Information & Broadcasting, Col. Rajyavardhan Singh Rathore and the Secretary, Ministry of Information & Broadcasting, Shri Bimal Julka are also seen. The Indian film industry is today the largest film industry in the world in terms of number of movies being produced. With about 1600 films made every year, the film industry is today a force to reckon with, having a turnover of a magnitude of Rs. One Lakh Two Thousand Six Hundred crores or US $ 16.14 billion. With the world’s youngest demography and the growing smartphone market, our country is likely to soon embrace a completely digital ecosystem which would help us connect with even larger numbers transcending geographical and cultural barriers. Digitization of film screens have allowed distributors to release films simultaneously across multiple screens which allows 60 to 80 per cent of theatrical revenues to be collected in the first week itself, something which was unheard of in the past. We need to reinforce this trend by ensuring the building of more screens for the overall health of our cinema. By now mainstream Hindi cinema is internationally recognized. We must also make focused efforts to project our regional films whose numbers as well as content are equally impressive and deserve global attention. We live in a rapidly changing world to which the film industry will have to adjust and adapt. Technology has brought down the costs of production and expanded the mechanisms of dissemination. Still cameras and cell phones that record video can be now edited on a home computer and uploaded on the net. Promotion and marketing of films have now taken on a new avatar with substantial marketing happening on social media – news of a good film now spreads quicker on twitter than by word of mouth. I also understand 2014 saw the launch of four film and entertainment focussed investment funds which is welcome evidence of the growing corporatisation of the sector. Cinema in India crosses all boundaries of region, caste, creed and religion. It reflects the immense diversity of our nation which is home to different cultures, religions and languages. It shows the confluence of modernity and tradition as well as our ancient past and billion aspirations for the future. Digitization and the advent of modern technologies do not mean that we lose touch with the grass roots. Our content has to be our strength as it is entrenched deeply in our vibrant cultural milieu. Today’s Awards are testimony to the fact that Indian cinema continues to brim and overflow with amazing talent. I am told that this year yet again the youth have made their mark. 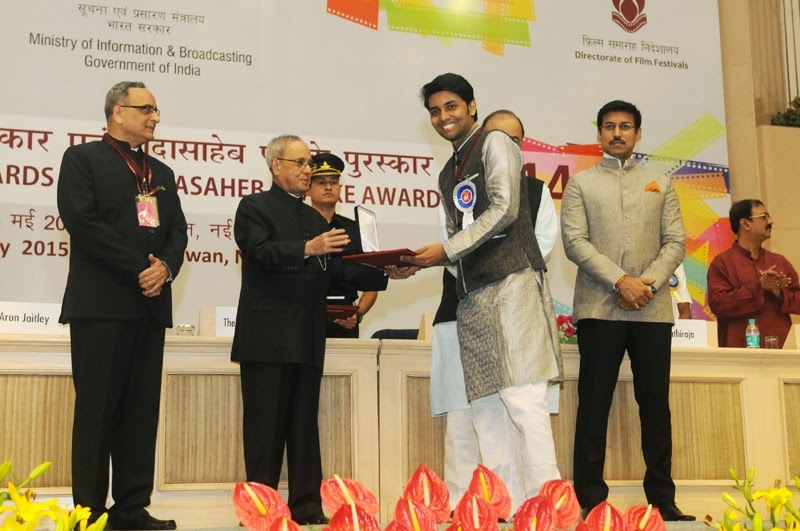 The winner of the Best Film Award, Chaitanya Tamhane is only 27 years old. His film “Court” has already created waves in the International Film Festivals. I am also delighted that the winner of the Best Female Playback Singer this year is young Uthara, who is all of ten years old. The flowering of creativity amongst our youth holds tremendous promise for the future. It reassures us that we will continue to lead the world not just in number of films produced but also in the quality of our cinema and the top class talent in our industry. The Government of India is taking a number of steps for strengthening and promoting Indian cinema and the film industry. The Government is planning to set up a National Centre of Excellence for Animation, Gaming, and Visual Effects. A National Film Heritage Mission is to be undertaken by the National Film Archives of India for conservation/preservation, restoration and digitization of films made in the country. The Government also proposes to set up a Film Facilitation Unit which will act as a facilitation point for filmmakers and production houses from foreign countries to enable them come to India and shoot their films in India. I am confident these measures will provide significant impetus to the growth of our film industry. Over the years the national awards have stood for excellence in all aspects of cinema in various relevant categories recognising talent in feature, non-feature, regional, technical, parallel and popular genres. 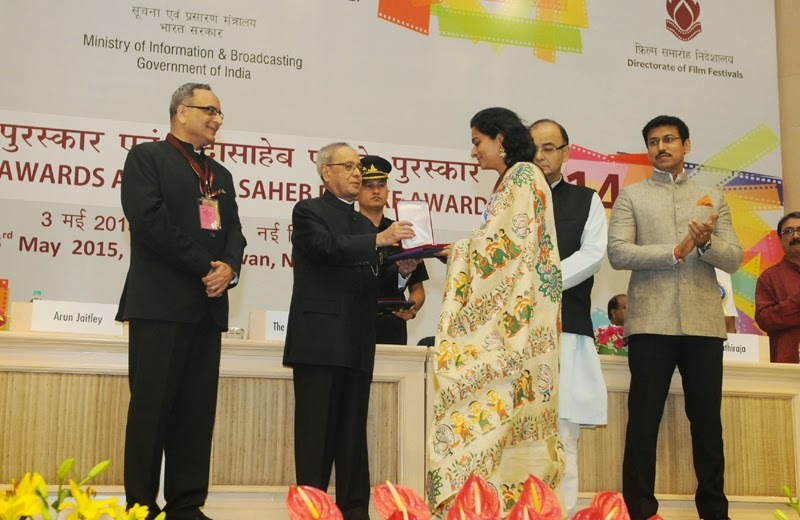 For those striving towards the pinnacle of success in celluloid, herein lies the greatest honour in this country. We must applaud the hard work and toil of all those who have been tireless in their efforts of achieving the end – which is to create a perfect work of art borne out by their creative imagination, technical prowess and knowledge of their field and choice of subject. In conclusion, I urge the film industry to look beyond markets and work together to help nurture universal human values that draw on our rich civilizational heritage that celebrates diversity and nurtures inclusiveness. We might remember here the iconic Ritwik Ghatak, a great filmmaker famously said ‘Cinema is no art for me. It is only a means to the end of serving my people’. 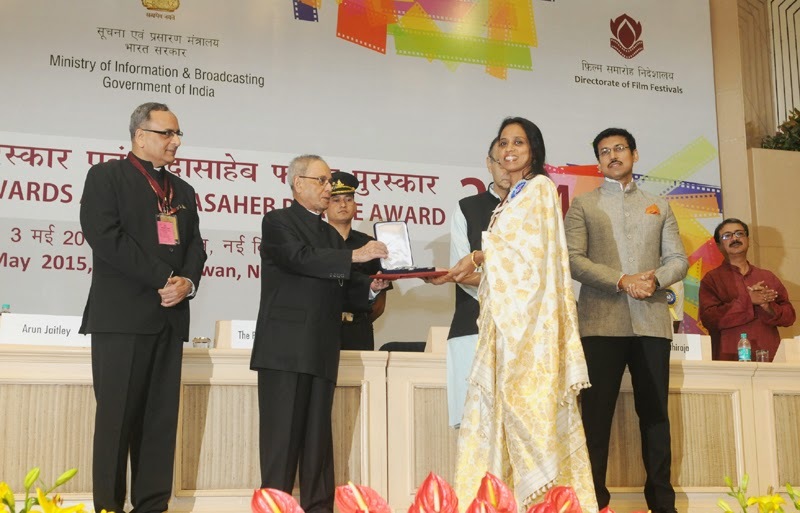 The President, Shri Pranab Mukherjee presenting the Rajat Kamal Award for Best Narration Voice over: “Nitya Kalyani – Oru Mohiniyattam Patham” in Non Feature Films Section to the Narrator, Ms. Devi S., at the 62nd National Film Awards Function, in New Delhi on May 03, 2015. The Union Minister for Finance, Corporate Affairs and Information & Broadcasting, Shri Arun Jaitley, the Minister of State for Information & Broadcasting, Col. Rajyavardhan Singh Rathore and the Secretary, Ministry of Information & Broadcasting, Shri Bimal Julka are also seen. 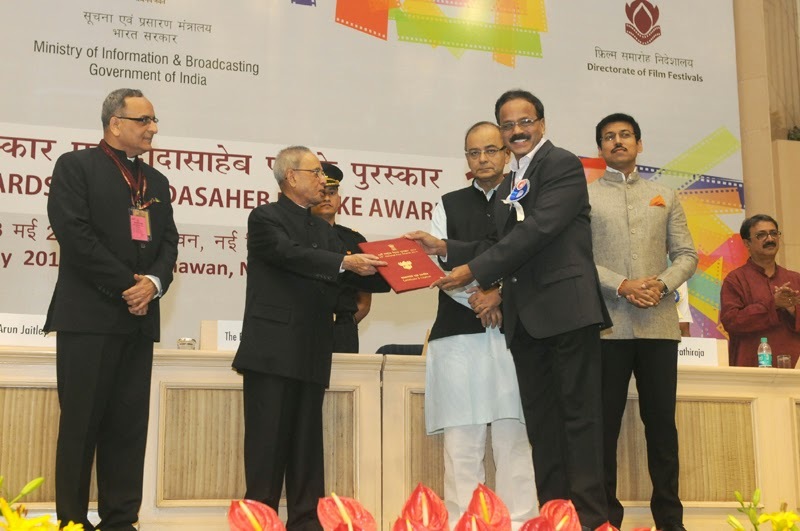 The President, Shri Pranab Mukherjee presenting the Special Mention Certificate for “Pride of Tamil Cinema” (1931-2013) in the category of Best Writing on Cinema to the Author, Shri G. Dhananjayan, at the 62nd National Film Awards Function, in New Delhi on May 03, 2015. The Union Minister for Finance, Corporate Affairs and Information & Broadcasting, Shri Arun Jaitley, the Minister of State for Information & Broadcasting, Col. Rajyavardhan Singh Rathore and the Secretary, Ministry of Information & Broadcasting, Shri Bimal Julka are also seen. 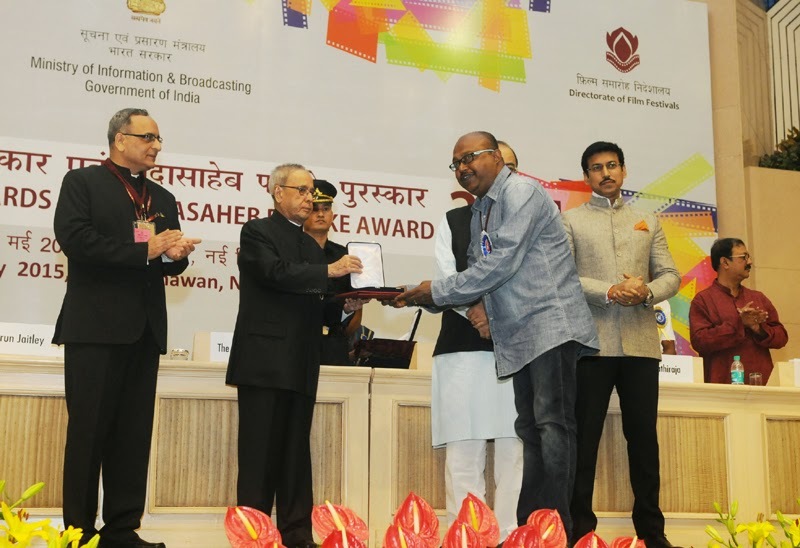 The President, Shri Pranab Mukherjee presenting the Swarna Kamal Award for Best Book on Cinema: “Silent Cinema” (1595-1930) in the category of Best Writing on Cinema to Shri Pasupuleti Purnachandra Rao, at the 62nd National Film Awards Function, in New Delhi on May 03, 2015. The Minister of State for Information & Broadcasting, Col. Rajyavardhan Singh Rathore and the Secretary, Ministry of Information & Broadcasting, Shri Bimal Julka are also seen. 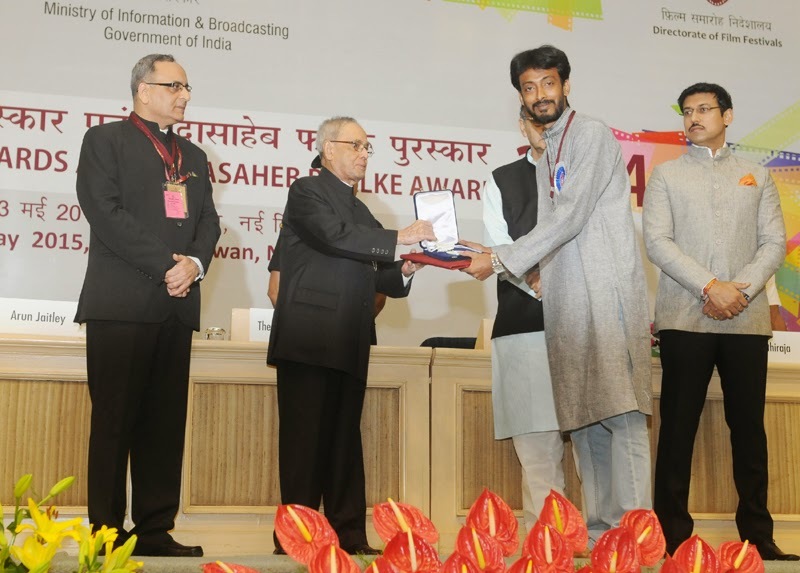 The President, Shri Pranab Mukherjee presenting the Swarna Kamal Award for the Best Film Critic in the category of Best Writing on Cinema to Shri Tanul Thakur, at 62nd National Film Awards Function, in New Delhi on May 03, 2015. The Union Minister for Finance, Corporate Affairs and Information & Broadcasting, Shri Arun Jaitley, the Minister of State for Information & Broadcasting, Col. Rajyavardhan Singh Rathore and the Secretary, Ministry of Information & Broadcasting, Shri Bimal Julka are also seen. I take this opportunity to once again congratulate each one of the Award Winners and wish everyone of them as well as all from the film industry gathered here continued success in the pursuit of excellence. I am confident that your creativity will touch new heights in the years ahead and you will continue to provide the people of our nation and the world superior as well as value based entertainment. 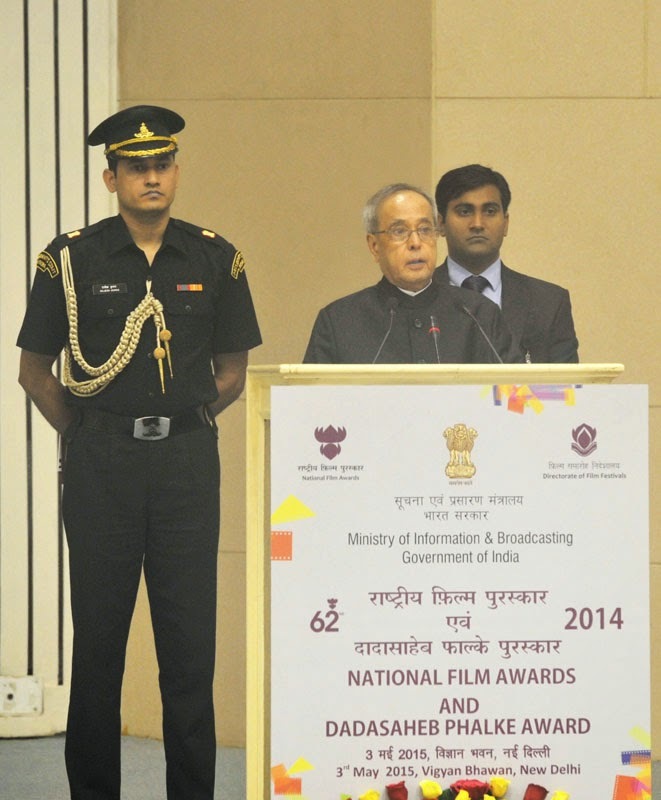 The President, Shri Pranab Mukherjee at the 62nd National Film Awards Function, in New Delhi on May 03, 2015. 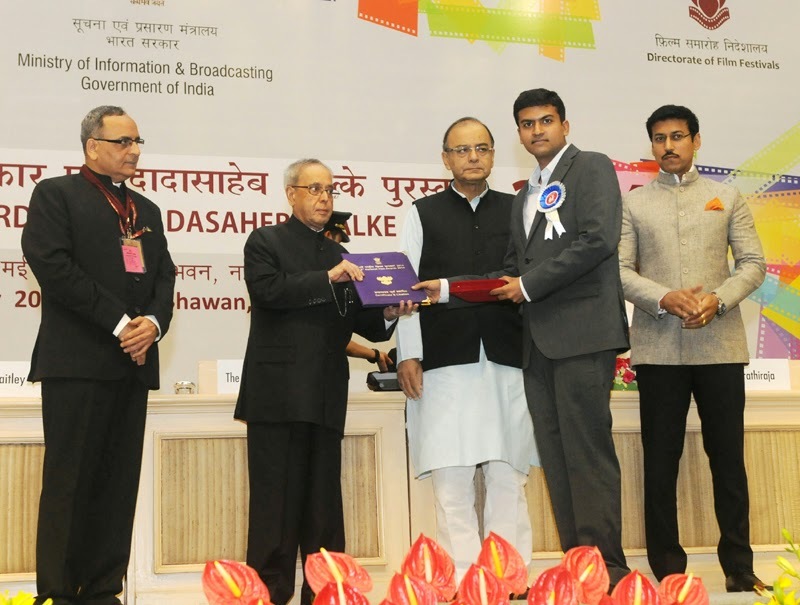 The Union Minister for Finance, Corporate Affairs and Information & Broadcasting, Shri Arun Jaitley, the Minister of State for Information & Broadcasting, Col. Rajyavardhan Singh Rathore, the Secretary, Ministry of Information & Broadcasting, Shri Bimal Julka and other dignitaries are also seen. 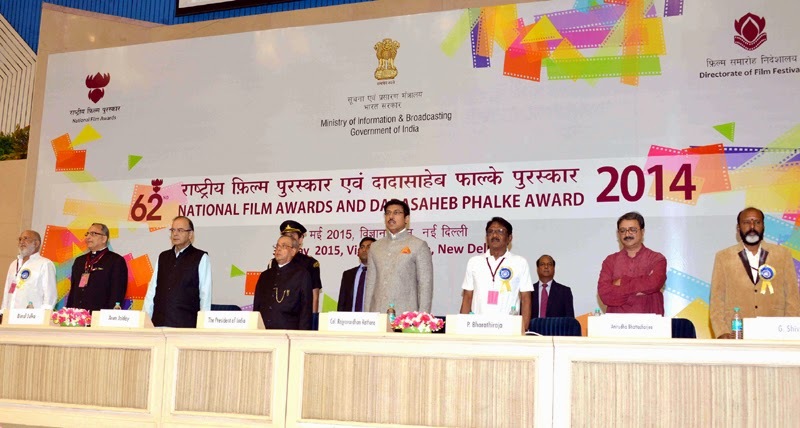 The President of India, Shri Pranab Mukherjee presented the 62nd National Film Awards yesterday (May 3, 2015) in New Delhi. 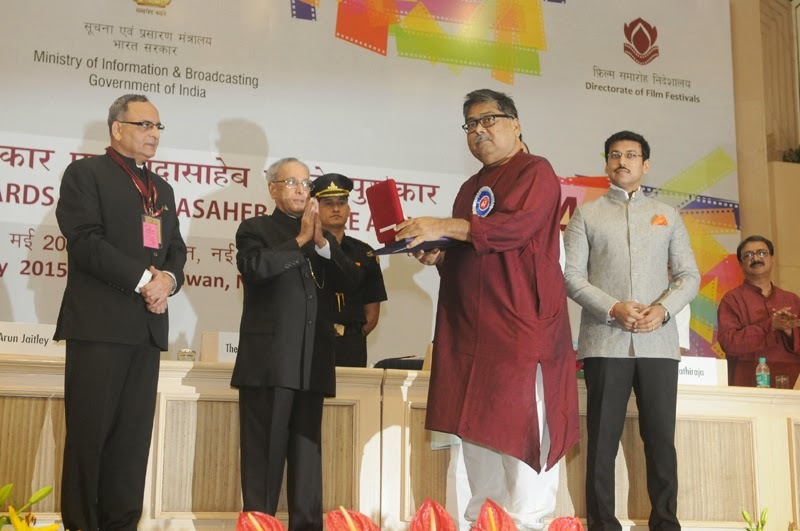 Speaking on the occasion, the President said cinema has been an integral part of Indian culture and entertainment from the days of Dadasaheb Phalke’s Raja Harish Chandra of 1913, the first film made in India. Indian cinema transcends national boundaries and is a powerful purveyor of ideas and values that impact the consciousness of millions of people. Indian movies not only showcase the multicultural diversity of the country but are also a tribute to its linguistic richness. They are a national treasure and our country’s “soft power” in the true sense of the term, forging international ties and navigating global horizons with ease. 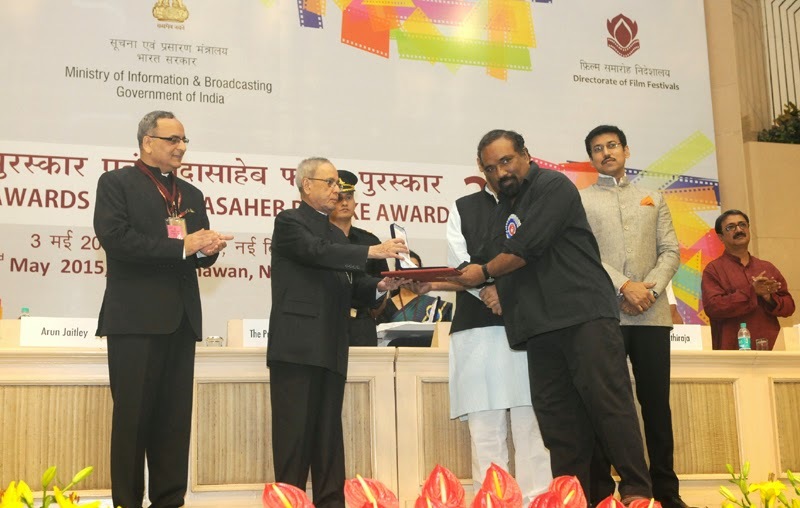 The President said cinema in India crosses all boundaries of region, caste, creed and religion. It reflects the immense diversity of our nation which is home to different cultures, religions and languages. It shows the confluence of modernity and tradition as well as our ancient past and billion aspirations for the future. Digitization and the advent of modern technologies do not mean that we lose touch with the grass roots. Our content has to be our strength as it is entrenched deeply in our vibrant cultural milieu. 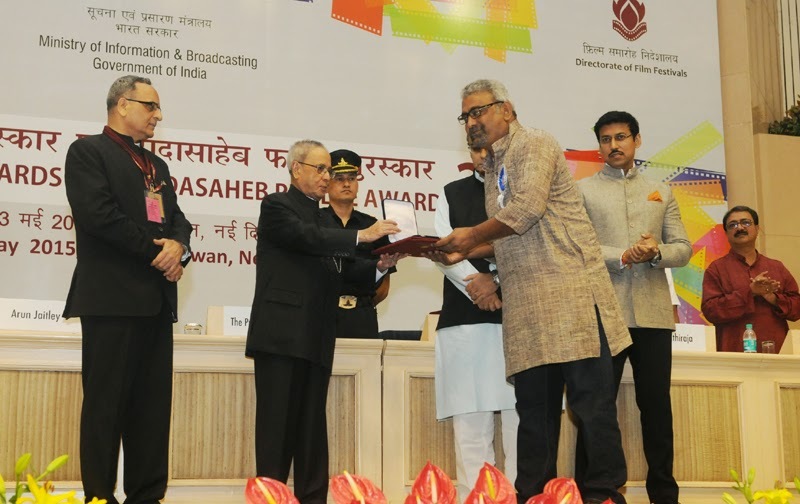 The President urged the film industry to look beyond markets and work together to help nurture universal human values which draw on our rich civilizational heritage that celebrates diversity and nurtures inclusiveness. He quoted Ritwik Ghatak, a great filmmaker and said ‘Cinema is no art for me. It is only a means to the end of serving my people’. The President of India, Shri Pranab Mukherjee has condoled the passing away of Shri Baleshwar Ram, former Union Minister and veteran Congress leader from Bihar. In a condolence message to his wife, Smt. Chinta Devi, the President has said, “I am sad to learn about the passing away of Shri Baleshwar Ram, a friend and colleague of long years. A veteran Congress leader and former Union Minister, Shri Baleshwar Ram served the nation in different capacities during his long public life. 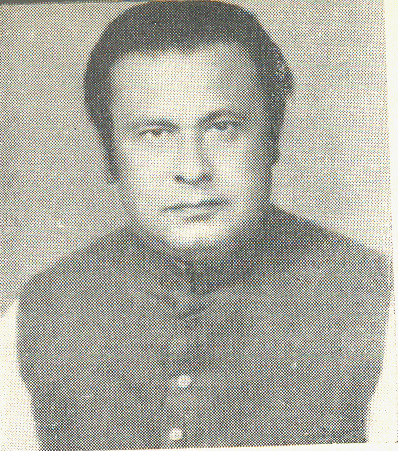 As a five term Member of the Bihar Legislative Assembly and Minister in the State Government in the sixties and seventies, he made immense contribution for the welfare and development of the people of Bihar, especially weaker sections. I had the privilege of working closely with him when both of us served as Ministers in the Government led by Prime Minister Smt. Indira Gandhi in the eighties. Please accept my heartfelt condolences and convey the same to the rest of your family members. I pray to the Almighty to give you and other members of your family the strength and courage to bear this irreparable loss”.